Robust, predictive post-market surveillance systems that monitor medical device safety after launch, reduce both costs and demands on resources and increase product safety and performance. However, as competition intensifies, could it be time to revisit the approach? Supplier Management Validation: What’s Your Plan? To fulfill the needs of trending technologies and Life Science needs, a global supplier management program helps to integrate an appropriate level of assurance that suppliers and vendors are able to consistently supply quality of materials and services that are in compliance with regulatory requirements. Is validated to effectively help your company to asses, manage and monitor supplier qualifications, and risk and compliance across your global supply chain process? Is consistently producing the expected results for the intended use that your company is continuously seeking? As MedTech manufacturers, do you have the right business and regulatory processes in place to manage your respective supplier management responsibilities? 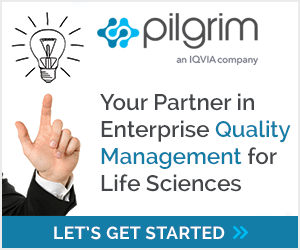 Last week, I presented Part 2 of Pilgrim Quality Solutions’ 4-part webinar series, Quality In, Quality Out, taking an in-depth look at supplier quality management (SQM) processes for both medical device and in-vitro diagnostic medical device manufacturers. The key takeaway from the presentation? These manufacturers need to secure and maintain effective supplier agreements to manage both the regulatory and business needs of the product/material or service being provided. Do you have the proper process in place to evaluate, monitor, track, and rate your suppliers? How confident are you that you can rely on your suppliers or even that you are protected from issues your suppliers encounter at any of their locations? Knowing your suppliers is as important as knowing the material they provide. Life Sciences regulators around the globe could not agree more! If you have a product defect, it doesn’t matter who is at “fault”, your supplier or your own organization. Do you have the proper processes in place to evaluate, monitor, track, and rate your suppliers? How confident are you that you can rely on your suppliers, or even that you are protected from issues your suppliers encounter at any of their locations?